Karam Melhem Karam: A heavy patronyme. Probably because in the language of Gibran and Neaimeh, it means generosity. An attribute that is not sufficient to describe the monument that Karam Karam bequeathed to the”Arab literature and the press of the Orient, encyclopedic. A world of two thousand books. 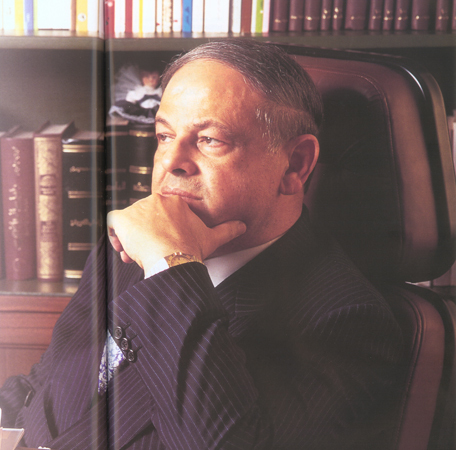 It is to his son who knew how to honor this legacy that we asked to tell the father.To understand the contribution of the Karam family to the intellectual wealth of Lebanon. Your father, writer, deeply influenced you, tell us about Karam Karam. He was an extraordinary man entirely devoted to his first love, writing. His life followed an unchanging ritual. He would start his work at four in the morning and stop five hours later. This early appointment with literature was sacred to him. It was the right time for writing that no noise was disturbing. 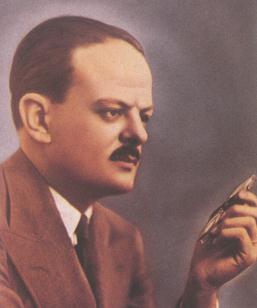 Karam Karam is the most prolific author known. Honoré de Balzac wrote thirty-four stories. Alexandre Dumas wrote one hundred. My father, meanwhile, wrote and published one thousand and two stories at a pace of a story per week in his weekly magazine Alf laylé wa laylé. This magazine assured him comfortable incomes because of its wide circulation. He also discussed the history of the Arabs to which he devoted more than four hundred books. He signed the editorial of three newspapers Al Assifa, Al Assrar and Al Ahed. The works of this author who was also a great reader were published between four to five thousand copies. Can you describe the personality of the man you mention so often. Wise man of great culture, my father had a thirst for knowledge and stoked my curiosity about all issues. In his eyes, there could not be a future for Lebanon without coexistence .It is in this symbiotic soil that the cedars could take root. He had teached all to his children, core values​​, beliefs, his unwavering principles. For every situation in life, there was a saying, a quote that summed up a way of life. These fair words have touched me and are stuck in my memory. For example, the fact that never go empty-handed to visit somebody, or that a person’s reputation is more important than his fortune, and we judge an individual’s actions and virtues not on his wealth, also he said that there are not impossible situations but rather beings who do not dare. It was essential to assimilate the lessons of life, save face” not to fall into pettiness, or careerism as being successful at the expense of others. Each of us has his chance, his opportunity, he said. One should be aware to grasp it. You got your law degree at age 21, and it is at this age that you reported to the presidency of the College Editors? At the time, I was practicing journalism and I worked laboriously for six magazines and newspapers for a monthly salary of1,400 Lebanese pounds!When I announced my decision to stand for election to the Order, my colleagues took my word slightly, not being able to imagine the veterans of the business dethroned by a newcomer, a young one Refusing to give up my allies to form a coalition with another list. I ended up carrying alone my campaign winning the election by 160 votes against 60 for outgoing president Ishak Mansour. The list that I chaired got two-thirds of board seats that left only three seats for competing candidates: Wafik Tibi, Edouard Bassil and HassanFakhri. How did your leadership get forged over the years, what event was the precursor? I owe a lot to my teacher in Sagesse school: Victor Lahoud had his own concept of education .Disciple of Maria Montessori and Johann Pestalotzi, he supported the emancipation of students, it is in this context that when we were in the fourth grade, he proposed us to elect a delegate who would be mandated to bring to the direction of the College claims and grievances of students. I was appointed automatically, since everyone unanimously wanted to elect me. It was my first experience in the public domain. Then I was elected president of the National Union for students, I remained for six years, then president of the Union of University students six years in a row. Between 1961, when you first took office, and 2000, in which direction the press has evolved, what are the major changes that have been made in this area? Two lawyers have marked journalism in Lebanon. Afif Tibi and Robert Abela I founded with these eminent jurists powerful and very active Order. We have been trying to continue this tradition. During the case of Safir, Mohammed Baalbaki, president of the Order of the Press andI have taken a common position to defend the interests of the press. Our intransigence and advocacy have earned us the abolition of two unjust measures, provisional arrest and administrative suspension, which was to suspend the release of a publication, charged with violating the law, until the verdict of the Court of Justice in its last remedy. This was a real obstacle to freedom of expression. Collaboration and agreement between the Order of the Press and the College Editors are made at all levels, we strive to maintain a harmony between the two agencies to avoid any dispute which might weaken us both. Our mission remains to protect the press. Do you share the pessimism of some regarding freedom of the press? Despite the contrasted opinions, I am convinced that freedom of the press continues in Lebanon. Around the world, experience has shown that attempts to muzzle the press have been doomed to failure. What are the reforms you have made to the College Editors? Once elected President of the Order, I was aware of the many problems this organization suffered. And it is especially during the Fouad Chéhab mandate that our various claims were heard by the state. Since then, any member of the College has the right to social security as well as tax rebates of 50% on local telephone call charges, 25% on international telephone calls, with an exemption of municipal taxes, at a50% discount on air fares. More recently the finance minister Ali Al Khalil even canceled the tax on the salaries of journalists. 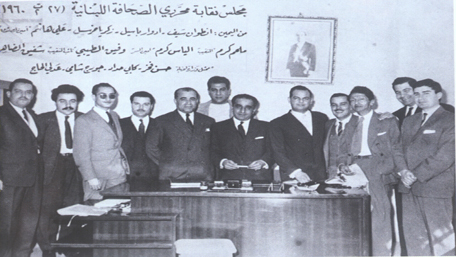 Assembly of the Order of Editors, 1960. Adli Hage, Georges Chami, Gaby Haddad, Hassan Fakhr, Chafic Daher, Wafic Tibi, le trésorier Elias Karam, le président Melhem Karam, Ali Hachem, Zakaria Kharsal, Edward Bassil, Antoine Seif. You interviewed forty- six international personalities, kings; presidents and princes. What have you learned from these meetings? It is essential for a journalist to maintain good relations with a head of state and never embarrass him… Indeed, in an interview with Egyptian President Anwar Sadat, I asked him a question in relation to the release of Ali Sabri. When the President read the interview before its publication, he suppressed ten questions and answers. I did not protest, we must consider certain imperatives and delicate situations with heads of state, being friend with a president is an honor, as he represents an entire state. I had the opportunity to meet several senior political figures including Presidents Jacques Chirac, Valéry Giscard d’Estaing, Kurt Waldheim. Is there a head of state with whom you have a personal friendship? His Majesty King Fahd, President Hosni Mubarak, the Emir of Kuwait Sheikh Ahmad Jaber Al Sabah. 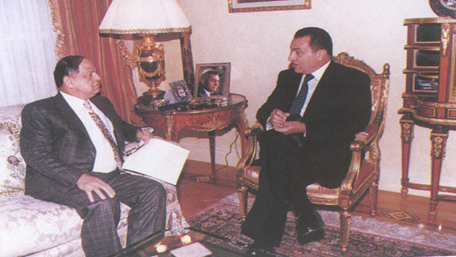 I maintained cordial relations with President Hafez Assad that I interviewed three times. I intended to meet with the Holy Father, one of the most influential figures of the last twenty years, but the interview was canceled at the last minute. Friendship with great personalities is important but the one that joins you with anonymous people, is more durable, is no less valuable. Your friends support you in your moments of crisis. By which personality you were mostly touched? King Hussein of Jordan was a cultured and lucid man. He had an extraordinary perception of the situation in the Middle East, and knew how to manage conflict. I also met several times with the Austrian Chancellor Bruno Kreisky whose patriotism really struck me. He told me that after political talks, Israeli Prime Minister Golda Meir left with a simple “Shalom,” referring to the Jewish roots of the chancellor, he replied dryly in German, stating that this linguistic allusion was the second humiliation he suffered after that of deportation. He gave a brilliant proof of his nationalism, claiming that he was Austrian before anything else. The president of the Order of Editors Melhem Karam and his Majesty King Abdallah the 2nd of Jordan. Many journalists have turned to politics and accessed important statutes. Among other personalities, Charles Hélou and Minister Bassem Sabeh. Have you never cherished such projects? They had asked me to be part of the list related to the government, but I refused. If I can only meet the demands of eight hundred people, it is almost impossible to be taken over half a million people without resorting o lies. Moreover, the very concept of politics in Lebanon, based on social gatherings and public relations, is completely wrong. What is your best scoop? 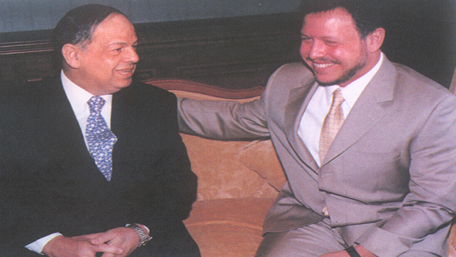 An authentic friendship and profound esteem bound me to the chair of Executive Saeb Salam. One evening while visiting him, Saeb Bey, at the time also Minister of interior, received a phone call, laconic, he whispered a few words in relation to Egypt and the armed factions. This was enough for the reporter that I was going to capture it all. We had found the murderer of Jawdat Chabouh, a businessman who had fallen out with his partner in Brazil, who sent him a parcel with a bomb. The case shocked the whole country. Admiring my flair, President Salam had reserved me the privilege of the photos preview and unique information but we had to take into account the reaction of the vice-president who was not other than GhassanTuéni from An-Nahar, so I agreed to publish this scoop in the morning in both my newspaper AlBayrak and in the daily An-Nahar. You occupy several functions simultaneously. You should always surround yourself with a loyal and competent team. For a president of an Order, I hold the world record of seniority, with forty years of continuous service. I run this organization affiliated with the OR (International Organization of Journalists). As the vice president of the World League of Journalists and the Federation of Arab Journalists, I make sure to protect the rights of journalists from all sides and all confessions. I am still very touched by the loyalty of members of the Order who have always trusted me. Your long career is punctuated with anecdotes ,highlights…Indeed! In this connection, I remember Josiane Aoun, Lebanese journalist at La Revue du Liban who filed a complaint with the Order against the publishing director who had made each employee of the Journal sign a discharge that he had received the total amount of his retirement. This was not the case. I went to see him, he denied everything, the colleagues of Aoun without even lifting a finger to protest or deny confirmed what he had said. The young rebelled journalist in front of such cowardice, rose, declaring loudly to her colleagues that if there was a man in this room, it was her! The director of the publication was quick to dismiss her. So I sued him, easily winning the case and getting the compensation of 3,200 lebanese pounds.The price of fame: my photos were banished from the magazine, and then one day I raised the mediatic “embargo” simply by becoming editor of the weekly. 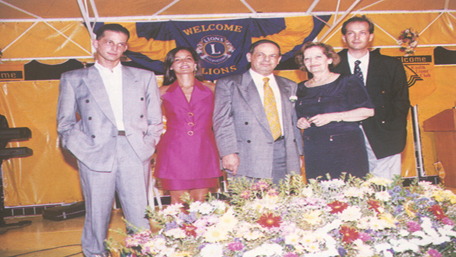 Family picture, from left to right: Saer, Carma (doctor in cardiology, wife of the cardiologist André Aoun), Melhem, Lili, Karam.